Disposition: Principal drafts to 3rd Battalion, 4th and 5th Canadian Mounted Rifles. Hi , Any information about Harrison B Williams Q.O.R served WW1 ? He was from Walpole Island Ontario Canada. So much history on this site. Great to have and learn from. Looking for information regarding William John Palmer, 83rd Battalion born 1893. Do pictures of these men exists and if so any clues on where to make a request. Thank you. There are photos of the 83rd on our Flickr site: https://www.flickr.com/photos/qormuseum/albums/72157676448387114 however they do not have names. There is nothing else flagged in our records at this time for William John Palmer. I assume you already have their service record off the Library and Archives website. 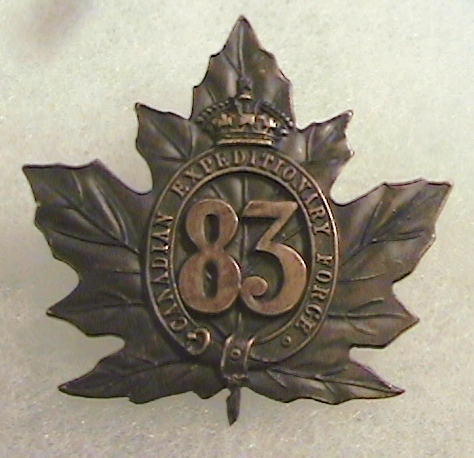 The 83rd was disbanded and supplied other regiments with troops before 1918, thus, your great uncle would have been fighting with another regiment…say, for example, the 4th Canadian Mounted Rifles…you will need to search his name and find out which regiment it was, then you can trace the movements of that regiment. The digitization project has been going on for some time (alphabetically) but isn’t complete yet. If you can find his service record, then you can figure out what battalion he actually fought with in Europe and check the battalion war diaries which could help to narrow down locations he fought in. I am researching the military records of my grandparents… Captain Richard Alexander Thomson… He was gassed at Ypres and met my Grandmother, Gladys Herod while recovering in hospital in France or England (?). I believe Gladys went over either with the CEF or shortly after as a nurse. She is from the 1st nursing graduating class at Wellesley Hospital in Toronto. I do have a copy of my grandmother’s enlistment papers. Can you direct me somewhere to look. What year was Mother born.?. I thought 1919? According to the paperwork date of Discharge is Sept. 30, 1917. Matthew we have “stood down” for August but please send us an email request to museum@qormuseum.org and we’ll follow up when we’re back at it in September. Is there any possibility of including the nominal rolls of this unit? I realize this might be a bit of a task. Hi Steve – we were able to track down a copy and you can now follow the link on the page above!